We purchased a new home in Sept. 2017 and its vastly different from our first "tiny" home (which we partially named the blog for). 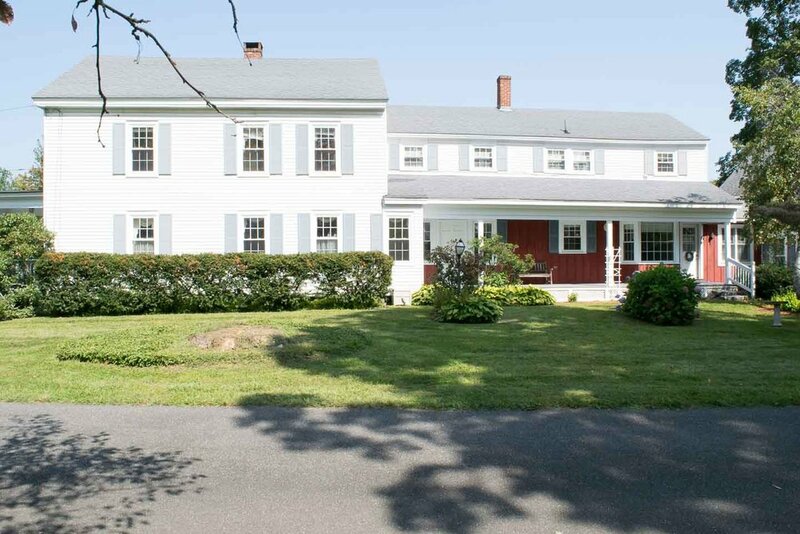 This large historic colonial from 1847 has given us the opportunity to become a multi-generational family (with the addition of my mother) and grow (with the addition of baby boy Kuc in Jan 2018). Here is what we are starting with, we hope to have a full Nursery reveal for you shortly as we are currently feverishly working on it. Otherwise, this will likely be a slow process but one we are so excited for, making this house our home. Hoping you can follow and get some inspiration along the way! 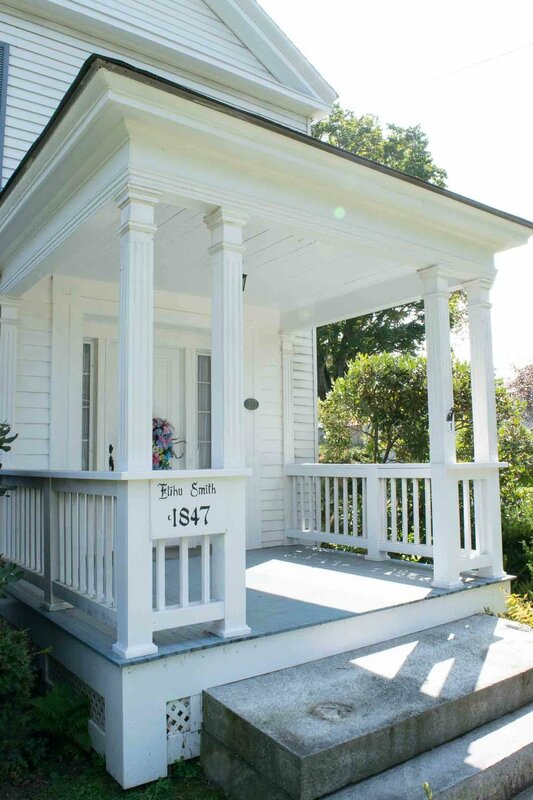 The outside of this historic colonial charmer is really wonderful, it needs a good scrubbing, some landscape trimming, and a bit more curb appeal (possibly a spring mini-makeover coming at you), but otherwise this is the view that made us fall in love at first sight. 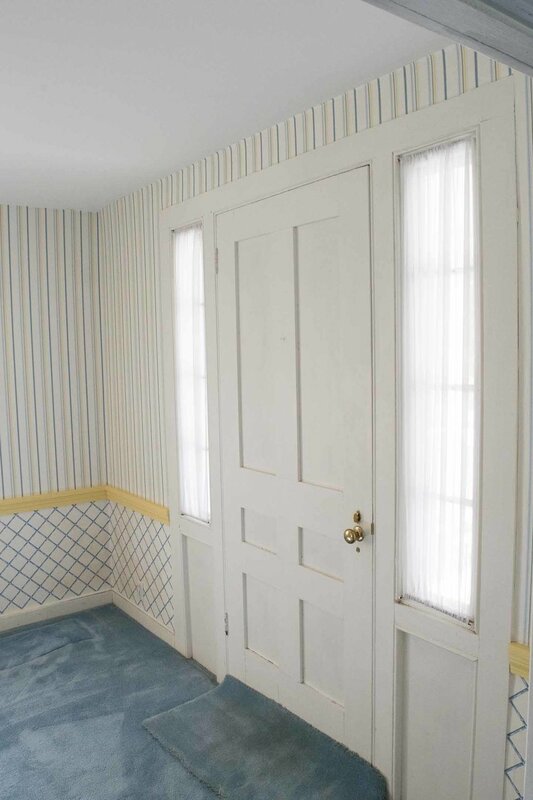 Formally used as another sitting area, this space will need to function as our entrance and mud room. I haven't even begun formulating plans on this space but envision the carpet coming up and some much needed storage being created. 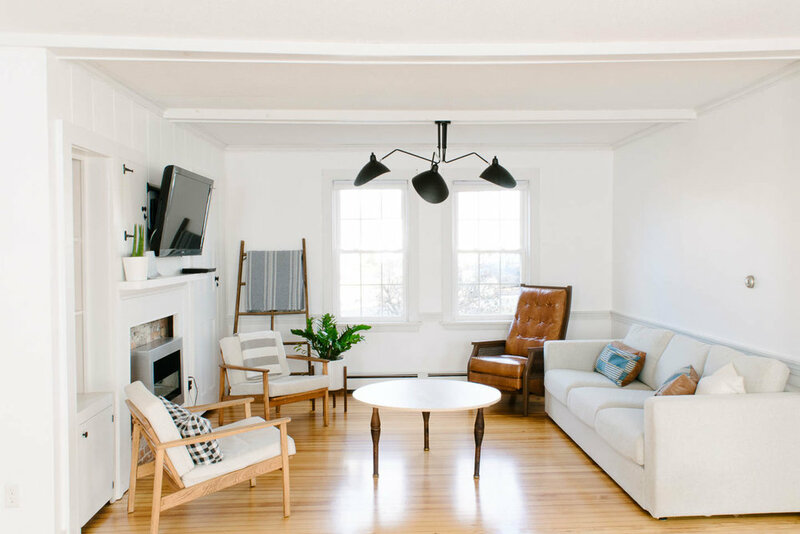 The ceilings feel really low in this space but they actually aren't, so I goal would be to brighten everything up and really work on some issues with the layout. Having a background in kitchen design makes me a hard cook to please, but eventually some updates will be done. The previous homeowner left a propane stove in the mud room we have been debating installing into this mantle, apparently it used to have a wood burning stove. 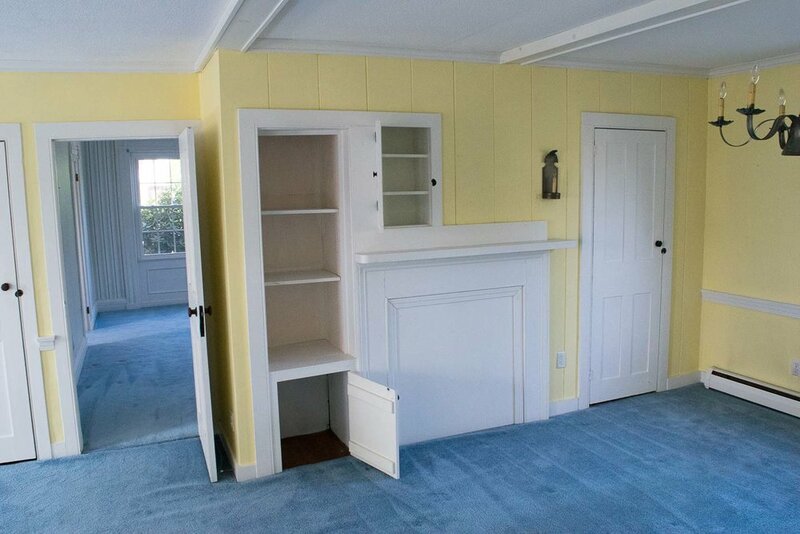 One of the very first things we did in this home was rip up the carpeting in the front area, and the living room finding the original heart pine floors! From there we proceeded to quickly makeover the entire living space before our son arrived in early 2018! Sadly the fireplace is actually blocked up, but we have some big plans for this whole area anyways. New lighting, shades, paint, and an eclectic mix of furniture to mix in with the historic architecture. The bench was built in by the last homeowner and will function as a toy chest for a play area! As you can imagine coming from a 1,000 SF home having a play area is a huge deal for us, it means we get space to be adults and space to be a kid with our kids. Since we became a multi-generational family with the addition of my mother Lorna, she needed some space of her own. When we found the house the front "Formal Living" and front entrance seemed perfect for her. We have two other side entrances to the home, and the garage is in the back of the house, so this formal entrance would rarely be used by us. 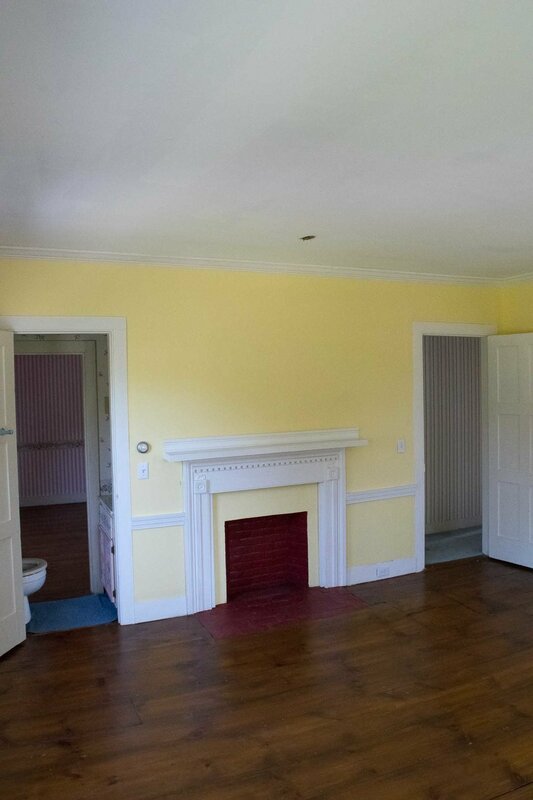 More yellow, but at least no wallpaper in this giant room! 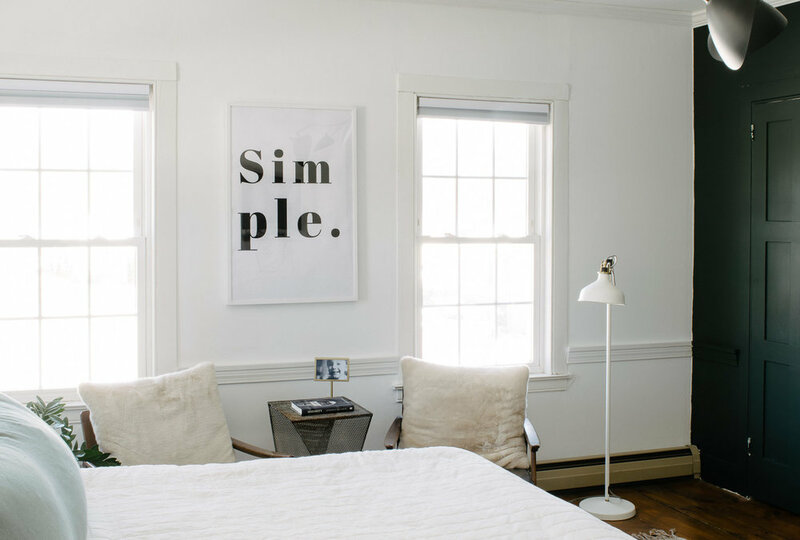 We love that our king size bed fits into this room with walking space around it (which was not the case in the last house). All this great lighting is going to make for a wonderful space to hang out in. Here is the master bedroom after a dark moody paint job, new light fixture, great artwork, and we even had room for an extra seating area. Absolutely heavenly. 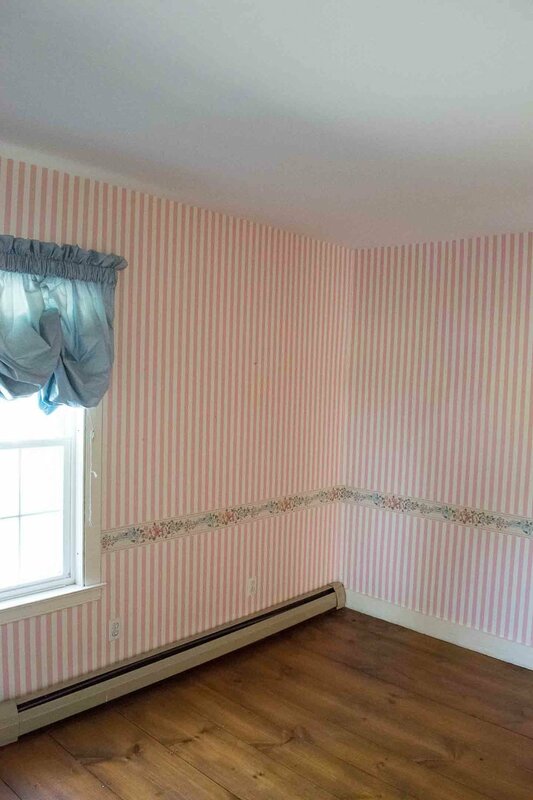 I'm really not looking forward to de-wallpapering this room since we will need to move a toddler out of it in order to get the job done. But.... apparently Haverly wants to be just like her mama since I caught her ripping some of it off the other night when she was supposed to be sleeping! We are currently working on the nursery for our little man (arriving Mid-January), you can check out the design plans, custom art, and mid-mod changing table here. 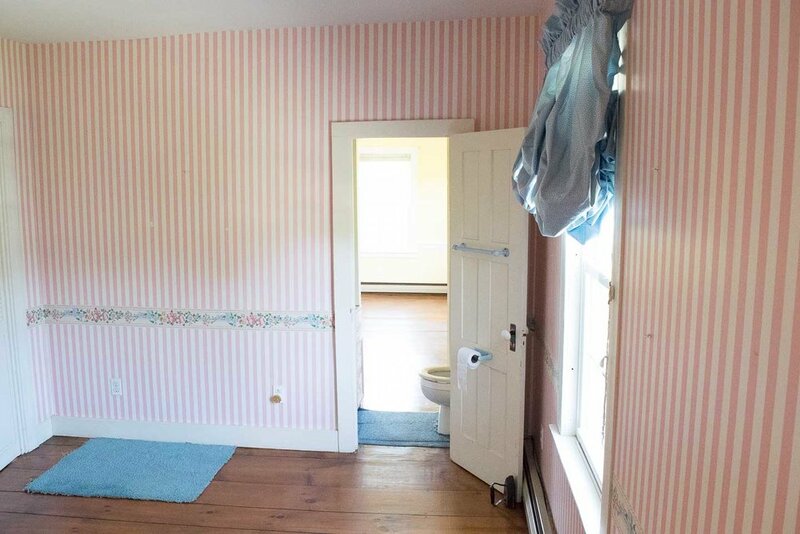 Lots of wallpaper removal in this section of the house, but I can't wait to have a real guest area in our home! We have a few area's in the house that I've left out like our laundry room and bathrooms ...but eventually we will get to those spaces as well!